One of the Wonders of the Universe is. . .You! God has been thinking and talking about you for centuries. Unbelievable? Not to the one who delights in you—His unique and intricate creation. Not to the one who was willing to die for the wonderful privilege of spending eternity with you. Wouldn't you like to know what God has been thinking about you all this time? 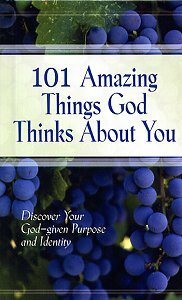 101 Amazing Things God Thinks About You offers you incredible facts from the Bible that will inspire, encourage, humble, amaze, and even surprise you. Let God's thoughts about you change how you see yourself and make you bold in achieving the destiny and purpose He has planned for your life.